Vampires! We’re doing it here! Welcome folks. This is R/B Vampires for Modern. As a tribal lover I am always really excited by a new tribe stirring up trouble. Innistrad was a set of spooky Victorian era tribes. Today we’re gonna be looking at my own take on a tribe that I feel can be built a surprising number of ways. The direction I chose for vampires was madness. As opposed to relying on always having a discard outlet out, I wanted to build it in a way that could function on a curve, regardless of having a discard outlet online. 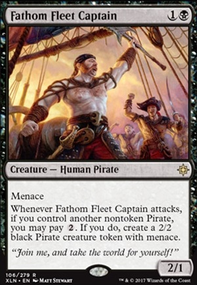 Then we can play a decent tribal deck that kicks it into ‘super mode’ if we manage to keep a discard outlet on board. With 10 discard outlets, it shouldn’t be too hard to get one or two a game. By keeping our curve independently strong and pairing it with versatile discard outlets we can seamlessly mold an aggro deck with new dimensionality. That was a point I made in my Spirits primer. The dimensions given here are obviously different but having them at all lets you leverage opponents in new ways. We get tons of removal in Fatal Push and Lightning Bolt . That's what these colors do. These are gonna keep the board clear, picking off whatever. Fatal Push can hit some bigger creatures that Lightning Bolt might not. A Scavenging Ooze , Tarmogoyf , Death's Shadow , Arcbound Ravager , etc. Bolt on the other hand can give us that additional reach to help close out games. There's a couple other non-creatures but they probably are best suited to be discussed after the creatures as they will explain those spells. Falkenrath Gorger is what enables ‘super mode’. It can be easy to trap yourself into trying to ‘go wild’. The key is not to lean on it but rather use it to visualize new windows and opportunities. Serviceable even as a two power one drop, he still small. While redundant copies don’t do anything, he is more vampires or discard fodder or crew fuel. Learning to play with this guy can be very rewarding. This is out Rattlechains . 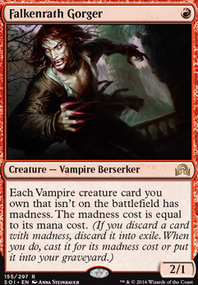 To really use the Gorger, you have to be playing plenty of vampires and plenty of ways to discard them, preferably without requiring an investment of mana. I WANT MY DISCARD OUTLETS TO BE GOOD, EVEN WHEN I'M NOT MADNESSING. I WANT MY VAMPIRES TO BE GOOD, EVEN WHEN NOT MADNESSED IN. Super important. If your vampires rely on madness as a means of discount, you’ll run into too many matches where you’re digging for your discard outlets or those outlets get picked off. If you have discard outlets that don’t do other things, you’re gonna be doing nothing when you’re empty handed. Also having diversity in the types of discard outlets gives us resiliency. Smuggler's Copter and Liliana of the Veil survive creature wraths and Copter survives Ugin wipes and All Is Dust . We try to avoid being blown out by any one card, mainly sweepers. Aggro decks don’t like sweepers. While madness is at the core of the build, we want a consistent plan to go into each game. We can more consistently rely on curving out creatures than having a discard outlet (though credit to the deck for being no slouch in that department). We want to assemble our tribe. Let’s take a look at who’s joining the party. Stromkirk Noble does suffer from classic one drop issues of little late game impact. Funny how much this feels like the anti- Champion of the Parish . This guy can be a menacing start to a game or simply Copter fuel/discard fodder. It’s pretty easy for this to match other one drop options and has the ability to get even bigger. Asylum Visitor is a vampiric Dark Confidant and honestly, I much prefer the Visitor in this build. It has more power and power is more relevant in tribal. It doesn’t gouge us if we hit something juicy. It has intrinsic madness which I have used in testing more than I would have ever thought. It even trigger on both players’ turns which can enable double duty if you play your cards right. Visitor and Liliana are also best friends. It’s like a Howling Mine that limits your opponent’s hand size to one. Bloodghast does what it does so well that it is a staple whose value is far more than simply its creature type (that typically doesn’t have anything to do with the decks that use it). Ordinarily I wouldn’t have this in a Vampire deck that was trying to play ‘slam em and bam em’ aggro. This thing can give our hand some wiggle room if we want to discard something and maybe we can’t or have decided against madnessing in something else. Unfortunately not all of our cards had intrinsic madness and we like to hold on to them sometimes. Go ahead and chuck this stupid idiot and hold on to all that precious juice. Our deck can very much take advantage of it as a veritable zero drop. Stromkirk Condemned could make an argument as the second best card in our deck. Most lords nowadays don’t buff themselves. That’s a subtle but sweet bit that helps push the card. We can dump Bloodghast s anytime. Extra lands are always there to dump. Obviously we want to talk about madness here too. We can use it for ultimate madness alpha strikes by madnessing in redundant lords. Instead of beating that dead horse a little more at a time, I’m gonna get the rest out. This guy is, at his face, a lord. Same as the next guy and the one after that. You see how we attempt to have a normal playable curve? A deck that can function without needing Copter, Liliana, or Condemned? Be a Vampire deck first and a madness deck second. Stromkirk Captain is our next lord up. Pay super close attention to how this card has nothing to do with madness. It’s just a solid vampire that you would curve out with anyway. It’ll put creature decks to the test as you mount a wall of pointy-fanged monsters. Seriously, first strike is highly underrated. This is simply our Lord of Atlantis . Our Master of the Pearl Trident . This just helps push us past creatures while stacking up damage as we widen our board. Sanctum Seeker is a newcomer to the list but most definitely a worthy one. Some might contend there are better four drop vamps out there and I won’t argue. But none can do what this does. Seeker acts as a lord with its drain trigger (which is free damage before blocks... and an out to Worship or other damage based locks?). Again, lord redundancy. But this guy pushes it further by rewarding us with stacks of life to help push the game further or keep us from death. We just keep playing vampires like a normal tribal deck. One little thing to note, this guy does not boost power. This will not allow your four power creature to take down five toughness blockers. As a one of curve topper, this shouldn’t translate to many gameplay issues, but it’s something to be aware of. Now we have one more important part to go over. This is the juice. This is what we all want to see. This is Magic fun time. Smuggler's Copter is so underrated in modern and it's absolutely bananas here. 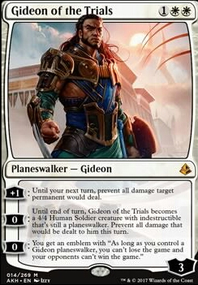 I say that Falkenrath Gorger is the centerpiece of the deck but this is the bread to the sandwich. Gorger just has the flavor but Copter brings it all together. This is a Copter deck wearing tribal skin. As proven in standard, you don't need madness to break a two mana 3/3 flying looter. Above curve evasive threat? Check. Incidental looting? Check. A way to make Stromkirk Noble less of a terrible topdeck? Check!!!! Liliana of the Veil is not an underrated card in modern. She is very good. Very very good. But we take her a step further. The feeling of ticking her up while you fill your board and your opponent fills their yard. Delicious. Repeatable removal is sweet too. Definitely nice for the aggro deck. Really she doesn't need to be elaborated. Just get a Gorger and plus all day. Plus to 11. Screw ultimates. Ultimates never won games. So that's R/B Vampire Madness. Let me know what you guys think and slam the big green one if you can dig it!!!! Kalitas, Traitor of Ghet is so good. But he is a midrange piece. A self contained value engine. The only part on him that has any tribal relevance is the bottom ability. Really this ability just serves to place the extra power he generates on himself in case that token gets blocked or you just want a bigger lifelinker. A lone Kalitas will gain you more life than a lone Sanctum Seeker . One important thing. No immediate value. You get a scary blocker but nothing else until you untap. Sanctum Seeker is no where near as versatile. He does one thing. But he does do his thing very well. He is simple, yet powerful lord. He shares Kalitas's resilience to Lightning Bolt . Despite their similar stats, Seeker swings in for 4 damage. One of which can't be blocked. The important thing!!!!! We can get sweet, delicious, same turn value when we play him. Kalitas is good as a standalone card but we can capitalize on what Seeker gives us better. A Seeker with just about any support will give us more value than Kalitas with equal support. 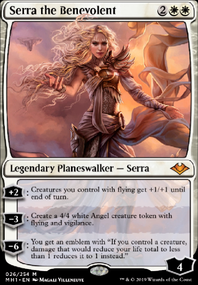 If we were maybe going for a more midrange style with the biggest and best ( Gifted Aetherborn , Gatekeeper of Malakir , Olivia Voldaren ), I would definitely be jamming Kalitas. But in a lower, go wide curve, Seeker is the boss. We get lord redundancy on top of the ability to gain chunks of life, extending our game. Seeker is the curve out, aggro topper for Vampire tribal. Anyone with thoughts on Sanctum Seeker ? Maybe I should just run another Stromkirk Captain ? What do you guys think?